Welcome to the Regional HQ. Find all your Regional information here. 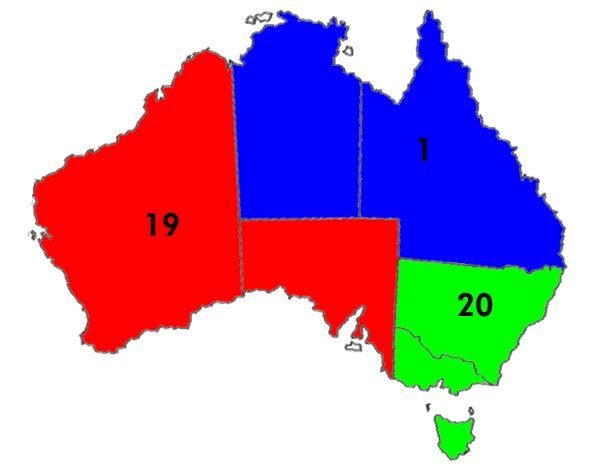 1: Briar Patch: Northern Territory and Queensland. 17: Neural: Brunei, Indonesia, Malaysia, Philippines and Singapore. 19: Deep Space Station K-7: South Australia and Western Australia. 20: Kazon Collective: Australian Capital Territory, New South Wales, New Zealand, Tasmania and Victoria. 2: Omarion Nebula: Denmark, Finland, Iceland, Ireland, Norway, Sweden and United Kingdom. 3: New Bajor: Belgium, France, Luxembourg, Netherlands, Portugal, Spain and Switzerland. 4: Vandros IV: Germany and Poland. 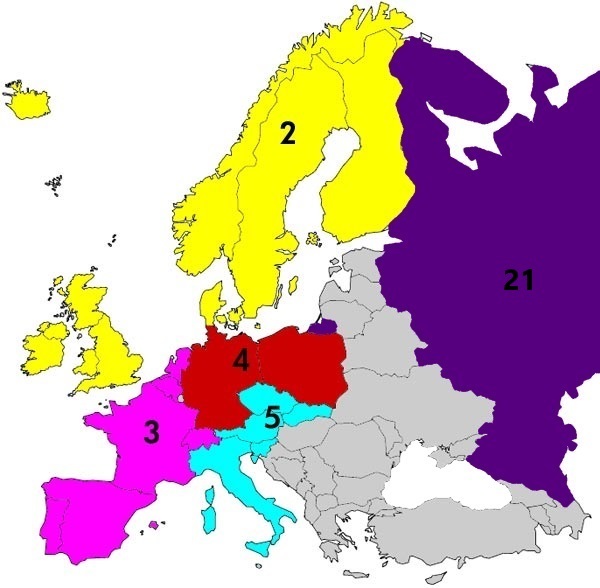 5: Borg Region: Austria, Croatia, Czech Republic, Hungary, Italy, Slovakia and Slovenia. 6: Breen: Alaska, Northwest Territories, Nuvanut and Yukon Territory. 7: Ferenginar: British Columbia, Idaho, Montana, Oregon, Washington and Wyoming. 8: Rura Penthe: Alberta, Manitoba and Saskatchewan. 9: Risa: California, Hawaii and Nevada. 10: Vulcan: Arizona, Colorado, New Mexico and Utah. 11: The Void: Arkansas, Kansas, Louisiana, Missouri, Oklahoma and Texas. 12: Qo'noS: Indiana, Kentucky, Michigan, Ohio, Ontario and Tennessee. 13: Deep Space 9: Illinois, Iowa and Wisconsin. 14: Sector 001: North Carolina, South Carolina, Virginia and West Virginia. 15: Cardassia: Alabama, Florida, Georgia and Mississippi. 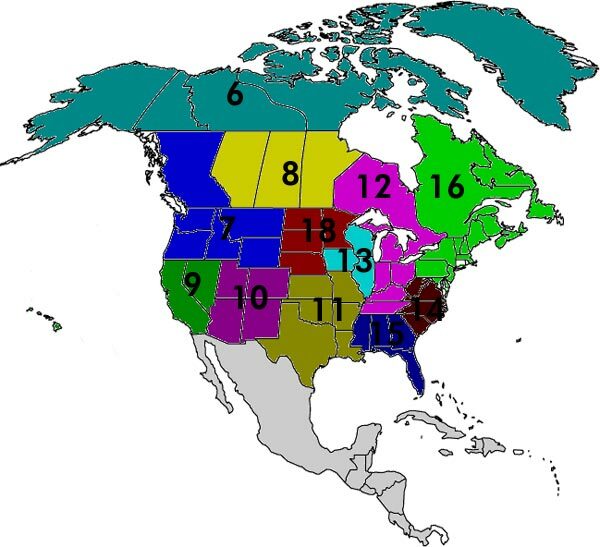 16: Romulus: Connecticut, Delaware, Maine, Maryland, Massachusetts, New Brunswick, New Hampshire, New Jersey, New York, Newfoundland and Labradour, Nova Scotia, Pennsylvania, Prince Edward Island, Quebec, Rhode Island and Vermont. 18: Andoria: Minnesota, Nebraska, North Dakota and South Dakota. 0: The Neutral Zone: Afghanistan, Argentina, Bermuda, Bolivia, Brazil, China, Haiti, Japan, Mexico, Saudi Arabia and South Africa.